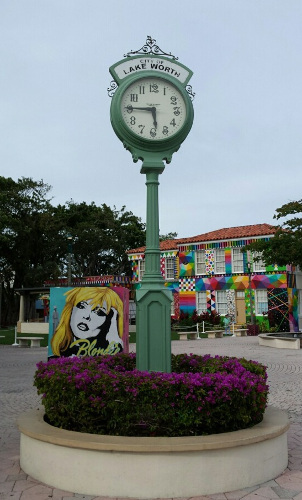 The Cultural Life of Downtown Lake Worth, Florida, U.S.A. When Spanish explorer Juan Ponce de León first wrote about the area that would become known as Florida during his mythical quest for the legendary Fountain of Youth, it was inhabited by Native American tribes such as the Apalachee, Pensacola, Calusa, and many others. Half a century later, the Spanish founded St. Augustine in 1565, and it remains the oldest, continuously occupied city established by Europeans in America. In the 1700s, the Seminole emerged as the most populous new indigenous tribe of mixed origin. The first American settlers arrived in the early 1800s and established the State of Florida in the west and the Republic of Florida in the east, after which the peninsula came to be first recognized as a territory and then a state in 1845. Throughout this time, three Seminole Wars were fought, with the last one lasting until 1859, and many Seminole were forced to relocate west. Future British composer Frederick Delius managed an orange plantation in Solano Grove from 1884 to 1886. Nearby Jacksonville had a lively music scene, and during his stay, Delius studied counterpoint and composition from organist Thomas Ward. Delius also heard African-American spirituals and work songs and published his first composition “Zum Carnival,” a polka for piano, during this time. After moving to Virginia and then back Europe, he distilled the musical impressions of this sojourn into the four movement Florida Suite (1887). Henry Flagler brought railroad connections from New York to Florida in the late nineteenth century, turning the area into a popular vacation destination. Thomas Alva Edison established a winter estate in Fort Myers in 1886 and was soon joined by Henry Ford as a neighbor. Cassadaga was founded by Spiritualists from Lake Cassadaga, New York, in the 1890s, and the town has since become known as the “Psychic Capital of the World” where one can still get a séance reading today. In 1917, British occultist Aleister Crowley stayed with a cousin at a citrus farm in Titusville, which was one of the major railroad stops. The Florida Land Boom of the 1920s led to rapid population growth that, for example, turned Miami into the city known today. During this time, Latvian immigrant Edward Leedskalnin built Coral Castle, a fascinating, life-sized outsider art structure that was eventually moved to the Miami area, where it is open to the public as a museum. Ernest Hemingway lived in Key West throughout the 1930s, and his home there is maintained as a museum while his favorite bar, Sloppy Joe’s, continues to function as a tourist attraction. Popular singer and novelist Jimmy Buffett has also been associated with the island, which, in a spirit of independent defiance, refers to itself as the Conch Republic. In this same spirit, the city has become a center for the homosexual community. Its beaches include the southernmost point of the continental United States from which Cuba can be glimpsed on a clear day. Daytona Beach has long been a favored destination for college students to celebrate spring break. In 1957, Jack Kerouac moved to Orlando and died in St. Petersburg in 1969. The Walt Disney World theme park, an expansion of the original Walt Disneyland in Anaheim, California, was opened near Orlando in 1971 and was followed in 1982 by the Experimental Prototype Community of Tomorrow, or EPCOT, Center. Its famous centerpiece is Spaceship Earth, a ride housed inside a Buckminster Fuller-inspired geodesic sphere that tells the history of the universe, humanity, and its future space-age through animatronic displays. Florida has long been a winter haven for touring circuses, as represented by the John and Mable Ringling (of the Ringling Bros. and Barnum & Bailey Circus) Museum of Art in Sarasota and the International Independent Showmen’s Association, which was founded in Gibsonton in 1966. The Burt Reynolds Dinner Theater was established by the quintessentially American namesake actor in Jupiter in 1979, and after becoming a well-known institution in the theatrical community, it continues to operate as the Maltz Jupiter Theatre. Jacksonville’s musical heritage can still be heard in the many Southern rock groups, such as Lynyrd Skynyrd, Molly Hatchet, and The Allman Brothers Band, that originated there. Cosmic American musician Gram Parsons started his career in the early 1960s in Winter Haven, while Tom Petty co-founded Mudcrutch in Gainesville in 1970. Clearwater, an early childhood home for Jim Morrison of the Doors, has served as “Flag Land Base,” an international headquarters for Scientology, since the 1970s. KC and the Sunshine Band was founded in Hialeah in 1973. Since the 1980s, the state has generally been famous for its Death Metal scene. Robert Rauschenberg moved to Captiva Island in 1970. The Salvador Dalí Museum established in St. Petersburg in 1982 houses the largest collection of the artist’s works outside of Europe. Today, a living kind of Surrealism can be read about in the exploits reported on the “Florida Man” Twitter handle, which documents sensational newspaper headlines from around the state such as, “Florida Man Disguises Himself in Bull Costume as He Tries to Burn Down Former Lover’s House With Pasta Sauce” (21 March 2018). The world’s first gore movie, Herschel Gordon Lewis and David H. Friedman’s Blood Feast (1963) was filmed in Miami. Fellow exploitation filmmaker Doris Wishman also had long-term connections with Miami, as did pin-up model and photographer Bunny Yeager, who is most famous for her work with Bettie Page. Throughout the state, naturist centers such as Sunsport Gardens, which was founded in Loxahatchee in 1965, provided ample material for exploitation filmmakers. The illegal drug smuggling situation in Miami in the 1970s and 1980s escalated to such outlandish dimensions that it came to be known as the Miami Drug War, as dramatized in the movie Scarface (1983) and the iconic television show Miami Vice (1984-1990). Fashion icon Gianni Versace was shot at his estate there in 1997. Miami is also a musical city. Criteria Studios, which had been built there in 1958, became a popular recording facility for many groups throughout the 1970s such as the Bee Gees and Eric Clapton. The city has also hosted the Winter Music Conference for electronic music since 1985. In 1992, local group 2 Live Crew, who were part of the Miami Bass scene and also recorded at Criteria, released an album that was initially declared to be illegally obscene, but the ruling was famously overturned on appeal. Regardless, they also became the first group to release an album featuring the newly mandated sticker warning about potentially offensive lyrics. Popular writers Carl Hiaasen and Dave Barry live there. Since 2002, Miami annually has hosted the international Art Basel Miami Beach exposition. Located within Palm Beach County some 100 kilometers north of Miami with a population of approximately 37,000 people (out of the County’s 1,500,000) is the town of Lake Worth. Further north, the County’s namesake island town of Palm Beach includes the opulent Breakers resort and expensive Worth Avenue shopping district, symbols of the way in which it has long been an exclusive enclave for the nation’s wealthiest families, celebrities, and citizens, such as John Lennon, the Kennedys, and the parents of William S. Burroughs. It is currently most famous for the Post family’s Mar-a-Lago estate, which is now owned and frequently visited by Donald Trump. Unsurprisingly, neighboring West Palm Beach on the mainland houses most of the area’s major cultural centers, such as the Raymond F. Kravis Center for the Performing Arts, the Norton Museum of Art, and the Armory Art Center. Further to the south, Delray Beach houses the unique Morikami Museum and Japanese Gardens, which was established in 1977 on land donated by the namesake farmer George Morikami, and Dada, one of the area’s most interesting venues and restaurants and part of the Subculture Group’s many enterprises. The National Enquirer tabloid media group, which includes the notorious Weekly World News, was based in neighboring Lantana throughout the 1970s and into the 1990s. Lake Worth is named after General William Jenkins Worth, who ended the Second Seminole War. The first non-indigenous settlers in the area were an African-American couple of former slaves who moved there in the 1880s. The town grew after Flagler extended the railroad to Miami in 1896, during which time the section between Jupiter and Lake Worth, which was originally known as Lucerne, was known as the Celestial Railroad. Mail throughout the area was delivered by a legendary team of “Barefoot Mailmen.” Having been forced to change its name since a post office named Lucerne already existed, Lake Worth was incorporated as a town in 1912. Electric lights were first turned on in 1914 and signs of the growth experienced during the Florida Land Boom of the 1920s can be seen in the Casino and Beach Complex, which was destroyed by a hurricane and rebuilt in 1947 and recently renovated again, and the still-extant but long-vacant Gulfstream Hotel. Paul Newman used the demolition of a building across the street from the Gulfstream as an element of his lead character’s story in the movie Harry and Son (1984). Downtown Lake Worth is a five block area along Lake Avenue and the parallel Lucerne Avenue to the north. At the eastern end of the strip along Federal Highway (a branch of the US Route 1 highway that goes from Key West to Maine) and M Street are the Mediterranean-style Old City Hall, which was rebuilt after being destroyed by a hurricane in 1928 and is today known as the Annex and houses the Lake Worth Historical Museum, and the Public Library, an Italian Renaissance style building from 1941. The Library’s featured collections include paintings by R. Sherman Winton about Florida during the Spanish period and wood carvings by Sam J. Schlappich. In addition to these organizations, the City’s heritage is also preserved by the Historical Society of Lake Worth. Between the two is the City Hall Annex Cultural Plaza which contains a memorial to Dr. Martin Luther King, Jr., and inspirational quotations from other civil rights leaders. The western end of downtown across Dixie Highway (part of a network that extends from Miami to Chicago and beyond) is marked by the current City Hall, which originally served as the Lake Worth Auditorium from 1934 to 1972. This area can be glimpsed in the downtown scenes of the movie Body Heat (1981), in which Lake Worth stands in for the fictitious Miranda Beach of Okeelanta County. In between these two ends on Lucerne is the Lake Worth Post Office, another Mediterranean revival building from 1941 that features the dramatic mural by Jospeh Myer seen at the top of this page. The Lake Worth Art League was founded in 1941, and it continues to be active, running a Gallery and Boutique that holds exhibitions and classes at Lucerne and L Street. Reflecting a similar spirit, Lake Worth today is purposefully positioning itself as a cultural center and artist community. The Cultural Council of Palm Beach County is headquartered on Lake in a strikingly white streamline moderne building that was originally opened in 1940 as a movie theater. After ceasing to operate in 1974 and serving as a restaurant and disco, the building was purchased in 1980 to house the private contemporary art collection of Palm Beach entrepreneur J. Patrick Lannan, which has since been moved to Los Angeles and includes pieces by Finnish artists including Tapio Wirkkala and Timo Sarpaneva. The building continued to serve similar purposes as the Palm Beach Community College Museum of Contemporary Art and then as the Palm Beach Institute of Contemporary Art, which existed from 1999 to 2005 and featured many adventurous exhibitions of artists such as Fred Tomaselli, Gunter Brus, and “The Smiths: Tony, Kiki, and Seton”. The building was eventually donated to the Cultural Council in 2012. The Council advocates for non-profit arts organizations, encourages education, assists with marketing and grants, hosts a gallery, and publishes arts&culture, a magazine that covers events and activities throughout Palm Beach County. For one of the Lake Worth Community Redevelopment Agency’s programs, the Council recently helped develop an Arts and Culture Plan to encourage development in the downtown area. One of the outcomes of the project is LULA, an arts organization named after Lucerne and Lake that promotes local artists, musicians, and venues, dozens of which are listed on their website. LULA is also behind the new HATCH 1121 exhibition space. Further west on Lake past K Street is the art deco Lake Worth Playhouse. The building was originally opened as the Oakley Theater, another movie house that was rebuilt after the 1928 hurricane. After its final days as an adult cinema, the building was purchased in 1975 by the Lake Worth Playhouse troupe, which had already existed for years and used to perform in the City Hall building when it functioned as an auditorium (the building still has a stage). The troupe is ready to launch its 66th season in October with classic titles such as Barefoot in the Park and Camelot. The building’s neon sign may have been the oldest that was still in use at its original location in the United States. The Playhouse includes the adjoining Stonzek Movie Theater, Florida’s only independent movie theater specializing in contemporary independent and foreign films. Programs are curated with an eye for both established directors whose new films are shown no matter what, as well as new filmmakers who demonstrate having a unique vision. The Stonzek has a small, devoted audience of core patrons who attend screenings every week regardless of what is playing. At the time of writing, the schedule included the latest Burt Reynolds’ vehicle Last Movie Star (2018). The Stonzek also produces a Black Box Series of plays with an “edgier” nature and more experimental, or minimal, stage design than those put on in the Playhouse. A number of places have been established along J Street, one block east of Dixie Highway, an area that can also be glimpsed in Body Heat. Propaganda and Revelry are bars and adventurous performance venues that also screen movies. The Book Cellar store and café has a well-curated selection and hosts regular literary events. The Bamboo Room is a long-standing rock and blues venue. In addition to all the establishments mentioned here, there are many other art galleries, antique stores, and craft emporiums throughout the downtown area where local artists sell their work, along with a variety of other businesses, restaurants, cafes, bars, and a kava lounge. Further away from downtown but worth noting is the Benzaiten Center for Creative Arts, which offers classes, exhibitions, and events and has an international reputation as a center for glass blowing. The other prominent theatrical venue in Lake Worth is the Watson B. Duncan III Theater at Palm Beach State College, which was the first public junior college in the State. The Theater serves as a performing arts instructional facility, and its programming is heavily geared towards musicals and song and dance revues. Lake Worth hosts several regular events. The Evening on the Avenues happens every Friday night as Lake, Lucerne, and some of the cross streets are turned into pedestrian areas with food, arts, crafts, food, and vendors. Live music is played in the City Hall Annex Cultural Plaza across the street from the Library. The 25th Annual Street Painting Festival, which attracts sidewalk chalk artists from all over the world, is scheduled for February 2019. The Stonzek Theater hosts the annual L-DUB Film Festival, which features work by emerging local and international filmmakers. Canvas, an event described as America’s largest outdoor museum, was held in Lake Worth for the first time in 2017. Ten large murals were painted in different locations throughout the city during the week-long event. The Zimmerman’s Café concert series held by the Core Ensemble at St. Andrew’s Episcopal Church, a few blocks east of downtown on Lucerne, allows composers from the South Florida area to hear their new compositions performed and discussed in a group setting with an audience. The annual Gay Pride Parade for Palm Beach County is held in Lake Worth, which also houses the County’s only LGBT center, Compass. Finns had long been coming to the area as domestic servants traveling with the wealthy families of Palm Beach during winter vacations, and they were provided with many of the bungalow cottages that still exist throughout Lake Worth. The first permanent Finnish-Americans started moving in the 1930s, with many coming from elsewhere in America to retire, and their numbers steadily increased throughout the following decade. Historian Veikko Vilhelmi Kopra, known today as William R. Copeland, believes that he may have been the first Finn to move directly from Finland to Lake Worth as a child in 1949, after the Finnish relatives he was sent to stay with had moved there from New York according to the usual pattern. After a period of stagnation that was even controversially decried in the Finnish press by Pasi Rutanen, a second wave of youths from Finland immigrated in the 1970s and 1980s and revitalized the scene. Together with neighboring Lantana and the unincorporated Lake Worth Corridor to the west, the community has been one of the largest Finnish populations in the world outside of Finland, and it also represents the largest of Lake Worth’s approximately fifteen different ethnic groups. Lappeenranta is Lake Worth’s sister city. Popular Finnish-American accordionist Viola Turpeinen retired to and died in Lake Worth, though she was ultimately buried elsewhere with her husband William Syrjälä. Finnish-American David Hinsa served as Mayor from 1985 to 1987. Comedian Eemeli Toivonen used to visit and perform regularly. The Finnish National Ballet has appeared at the Duncan Theater and several choirs have also toured the area. Race car driver Hannu Mikkola, popular singer Eino Grön, and opera star Hilkka Kinnunen are regular visitors, like the thousands of Finnish tourists who come every winter. Finnair has revived its seasonal, direct flight to Miami. In 1985, a monument honoring Finnish immigrants was erected in Bryant Park next to the Gulfstream Hotel, and the Midnight Sun Festival, which was previously known as Finlandia Days, is held there annually. The next one is scheduled for the first weekend in March 2019. The Finnish community was big enough by the 1970s to need its own telephone directory. There are still enough Finnish bakeries, car rental companies, real estate agencies, travel agencies, and law offices to have their own branch of the Finnish American Chamber of Commerce. There is an honorary Finnish consulate. The Finnish-American Village serves as a retirement home. Different religious denominations are represented by St. Andrew’s Lutheran Church (Suomikirkko), the Pentecostal All Nations Church (Kotikirkko), and the Laestadian Lutheran Church of Florida in Lantana. Similarly, the American Finnish Club (Kerhotalo) on Lehto Lane and the American Finnish Tourist Club (Suomitalo / Finland House) on Finlandia Boulevard in Lantana historically represented different social and political viewpoints. Both host movie showings and special events, such as celebrations for Finnish Independence Day. Though the long-running weekly radio program and Finlandia Weekly newspaper no longer exist, American Uutiset continues to be a nationally distributed publication. The community has also established the informative USASuomeksi website, which provides information and links for relevant new immigration and travel laws, Finnish news, local events, and advertising for local businesses. The Finnish Heritage Society of South Florida is working to digitally preserve the community’s history. Because of the Finnish-American community, the Stonzek Theater keeps an eye out for new Finnish movies to show. Past titles have included The Man Without A Past (2002), Steam of Life (2010), and The Happiest Day in the Life of Olli Mäki (2016). The community, usually through the office of the honorary consul, has also rented the Playhouse for concerts and recitals by visiting Finnish artists. The community also donated an exhibition consisting of two cases and a vertical display with costumes, glassware, coins, and jewelry to the Historical Museum. Here are three favorite personal memories from my life in South Florida. First, I was always tremendously fascinated and intrigued by the visits that our family would occasionally make to the Native American Powwows that continue to be held regularly by different tribes throughout the State. The second was watching Paul Newman film the demolition scenes for Harry and Son, a rare brush with celebrity, and naively wondering why nothing seemed to be happening on what was supposed to be a movie set. Years later during the Evening on the Avenues, the owner of a second hand bookstore at the end of Lake Avenue, now long gone, would stand outside and play haunting Theremin solos during the warm, balmy evenings. Many thanks to Bama Lutes Deal, Ph.D., of the Cultural Council of Palm Beach County, Charlie Birnbaum of the Stonzek Theater, and City Historian Helen Vogt Greene of the Lake Worth Historical Museum for taking the time to talk, answer questions, and provide important information. T.D. Allman. Finding Florida: The True History of the Sunshine State. New Yok: Grove Press, 2013. Eric Blom. “Delius and America.” The Musical Quarterly, Vol. 15, No. 3 (Jul., 1929), pp. 438-447. Jouni Hokkanen Nalle Virolainen. Roskaelokuvat. Helsinki: Johnny Kniga, 2011.